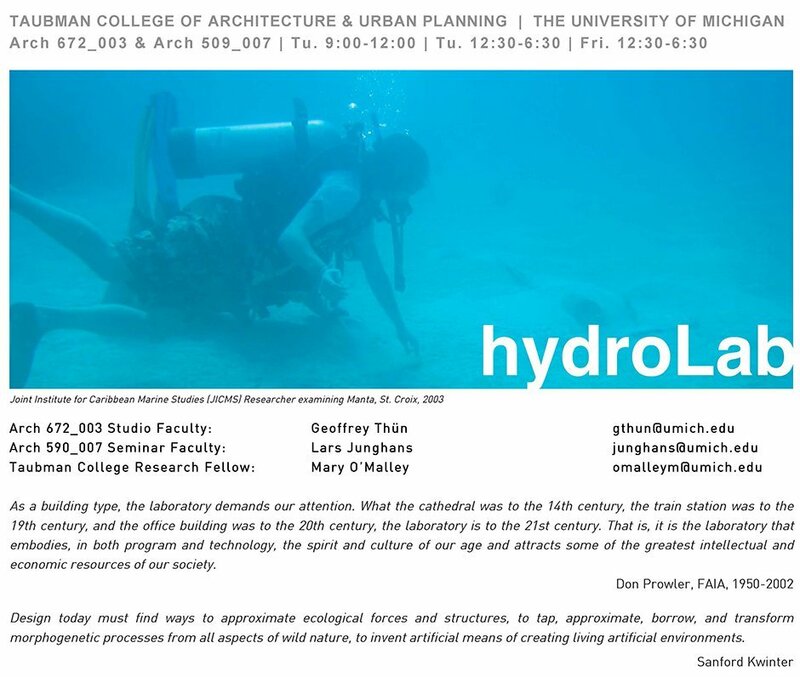 HydroLAB: Graduate Studio Review at the Taubman College of Architecture & Urban Planning at the University of Michigan | Williamson Williamson Inc.
Betsy Williamson learned a new word last week: Anthropocene… Professor Geoff Thun’s advanced studio was charged with designing a laboratory for the 21st century and presented provocative and complex projects at their final studio review. It was a pleasure to sit with Kiel Moe and Amy Kulper to engage and discuss the students’ work. An excerpt from the studio brief, “What should be the ambition of architecture in a time when the earth’s lithospheric and geoclimatic condition has been so fundamentally reshaped by human intervention as to necessitate the definition of a new geologic era, recently proposed to be called the Anthropocene? The identification of this new geologic period attends the emergence of our cultural awareness of a trans-terrestrial interdependent ecosystem, of globalized cultural and economic activity, of ubiquitous computing and information exchange – an era of ever expanding interconnectedness across intellectual and disciplinary boundaries, causality, time and space. This is also an era that has been referred to as the Petabyte Age, where the ability to gather, process and store massive amounts of data is transforming the fields of science, business and technology to move beyond coherent models and unified theories for explanation, and, increasingly, rely on the correlation of the numbers themselves, producing a fundamental paradigm shift in scientific theory across disciplinary specializations. On the one hand, this context reinforces the blurring of boundaries between categories previously juxtaposed; landscape:building, culture:nature, inside:outside, system:environment, control:observation, robust:weak or structured:self-propagating. In this context, how might we rethink the construct of the Laboratory, simultaneously a locus for scientific discovery, a site intended to foster creative innovation, an engine for public education, and a substrate for new ecologies? If the laboratory is to really embody the “spirit and culture of our age” then it must do so not only by way of program, but by way of the architecture itself – and in turn this may suggest new architectural models”¦The hydroLab Studio and Seminar will explore these questions in developing the Joint Institute for Caribbean Marine Studies (JICMS) Marine Research and Education Center, a radical closed-loop high performance micro campus facility located in the Salt River Bay National Historical Park and Ecological Preserve on St. Croix in the US Virgin Islands. This new building type will be shaped by the unique pressures surrounding island development within a tropical climate, where resource scarcity, proximity to sensitive ecosystems, human comfort in a relentless environment, and the demand for resilience often produce competing agendas. Rigorous technical development and system performance simulation will occur alongside a fundamental questioning of the social and environmental realms produced by such institutions.